IDAHO FALLS, ID – There is a RED FLAG WARNING in effect for gusty winds and low humidity across the Snake River Plain from noon today until 10 PM tonight. High temperatures should reach the low nineties with winds increasing from 6-9 mph to 13-23 mph with gusts up to 35 mph. While there are currently no fire restrictions in effect on lands managed by the Idaho Falls District Bureau of Land Management or Caribou-Targhee National Forest, residents and visitors need to exercise caution when working or recreating outdoors due to the extreme fire conditions. Additionally, several eastern Idaho counties do have open burn bans in place. Eastern Idaho Interagency Fire Center resources have responded to three smoke reports since Tuesday. The Danish Flat Fire, located 2 miles south of Liberty, UT was an escaped campfire that burned one-tenth of an acre. The Tincup Fire, located 6 miles southeast of Wayan, ID was a one-tenth acre fire caused from a motor vehicle accident. Crews also assisted Bingham County on a fire located 4 miles northwest of Aberdeen, ID. The Lanes Creek Fire located about 10-miles north-northwest of Thayne, WY has grown to 64-acres.The fire started on June 30, 2016 by lightning. The fire was active on Wednesday, but relatively inactive yesterday despite the hot, dry conditions. 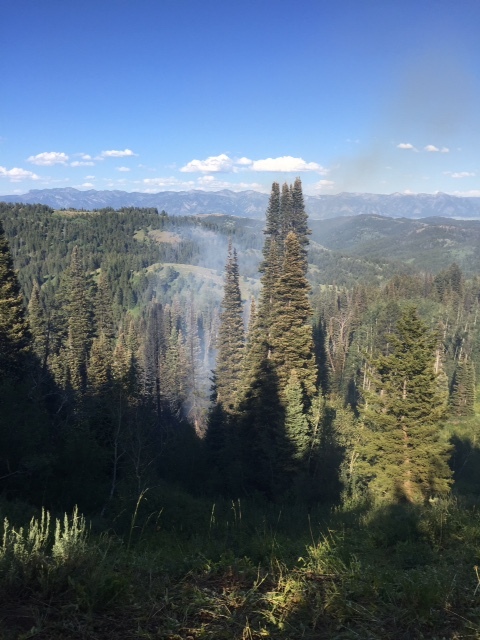 The Caribou-Targhee National Forest is managing the Lane’s Creek Fire to meet multiple objectives, including allowing a naturally-occurring fire to play its role in the forest ecosystem. The 20-person hand crew that was assigned to the fire completed their fuels reduction work in areas of most concern and have been released from the incident. The remaining engine crew members are actively monitoring the fire throughout the day. A remote camera has also been placed near the fire which allows for constant monitoring during daylight hours through electronic transmission. While the Lane’s Creek Fire is burning in conifer, there are also large pockets of aspen and grass. Much of the grass is still green but will start to cure out as temperatures increase and humidity decreases over time. 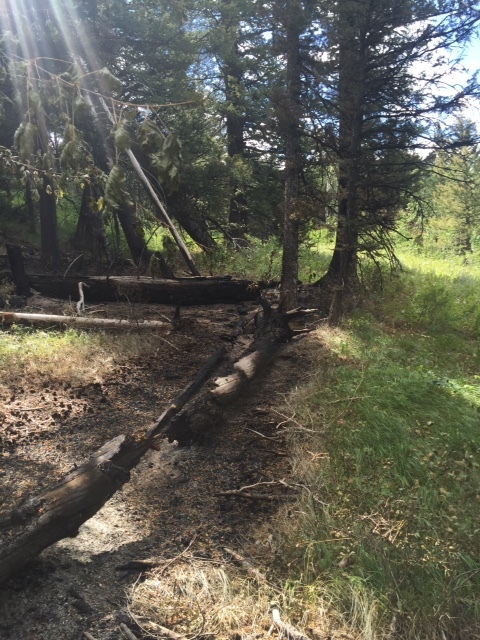 There are large down and dead logs or trees scattered on the ground. The fire may creep from these heaver fuels into lighter fuels, eventually igniting small standing trees. Sometimes sparks or embers from standing trees will be carried by the wind ahead of the fire. This is what is referred to as spotting. Aspen trees thrive on disturbance to generate new growth. Therefore, allowing the fire to burn in natural mosaics will increase health in the aspen stands. This fire is being managed and watched carefully. Fire managers are utilizing best science and modeling in projecting future fire spread potential. As the fire continues to burn within projected parameters, the organization and staffing will change to meet management objectives.